We’d love your help. Let us know what’s wrong with this preview of Company Man by John Rizzo. From the “most influential career lawyer in CIA history” (Los Angeles Times) an unprecedented memoir filled with never-before-told stories from his thirty-year career at the center of the U.S. government’s intelligence program (1976-2009). In 1975, fresh out of law school and working a numbing job at the Treasury Department, John Rizzo took “a total shot in the dark” and se From the “most influential career lawyer in CIA history” (Los Angeles Times) an unprecedented memoir filled with never-before-told stories from his thirty-year career at the center of the U.S. government’s intelligence program (1976-2009). In 1975, fresh out of law school and working a numbing job at the Treasury Department, John Rizzo took “a total shot in the dark” and sent his résumé to the Central Intelligence Agency. He had no notion that more than thirty years later, after serving under eleven CIA directors and seven presidents, he would become a notorious public figure—a symbol and a victim of the toxic winds swirling in post-9/11 Washington. From serving as the point person answering for the Iran-contra scandal to approving the rules that govern waterboarding and other “enhanced interrogation techniques,” John Rizzo witnessed and participated in virtually all of the significant operations of the CIA’s modern history. 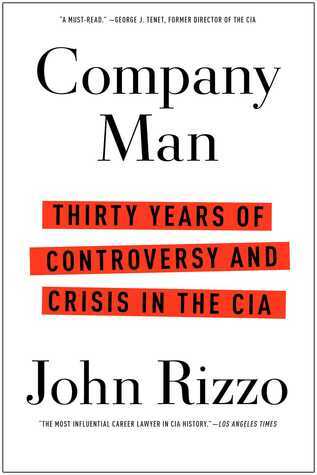 In Company Man, Rizzo charts the CIA’s evolution from shadowy entity to an organization exposed to new laws, rules, and a seemingly neverending string of public controversies. Rizzo offers a direct window into the CIA in the years after the 9/11 attacks, when he served as the agency’s top lawyer, with oversight of actions that remain the subject of intense debate today. 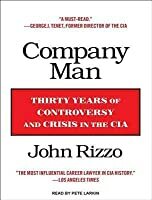 In Company Man, Rizzo is the first CIA official to ever describe what “black sites” look like from the inside and he provides the most comprehensive account ever written of the “torture tape” fiasco surrounding the interrogation of Al Qaeda suspect Abu Zubaydah and the birth, growth, and death of the enhanced interrogation program. To ask other readers questions about Company Man, please sign up. Rizzo covers such incidents as the Yuri Nosenko affair, the Church Committee, Iran-Contra (which put Rizzo on the map, which he describes as “fun as hell”, and which he calls “the best thing that happened to me in my career”), the historical origins of written presidential findings to authorize covert action (mandated by Congress and left for Rizzo to figure out), the Aldrich Ames case (a particularly gripping part of the book), the Wilson/Plame affair, and others. He describes the controversies and media storms surrounding the Agency’s use of “dirty assets” in places like Guatemala, and how these resulted in CIA officers becoming less inclined to recruit them---until, of course, Congress and the media easily derided the CIA’s “risk aversion” following 9/11. He also describes the impossibility of getting any purely lethal operations against bin Laden approved, as well as the more basic problem of obtaining reliable intelligence about bin Laden’s whereabouts and movements. Rizzo also covers, more generally, the CIA’s drone programs and notes the irony of targeted killings generating less outrage from Congress and human rights groups, and less media coverage, than the EITs. He notes the additional irony that targeting terrorists for lethal action was “always a big deal during the Clinton administration,” a turn of events Rizzo finds “perverse.” He notes that drone strikes expanded dramatically under Obama and that human rights groups were drawn to the program partly because they needed a new issue to attack following the end of the RDI program. Rizzo’s treatment of all the figures he interacted with will strike some as too uncritical, although he does not seem to be a fan of the likes of Ron Wyden (“a foe who could not be appeased”) or various others. He is fairly critical of Clinton’s inaction regarding the al-Qaeda threat but says less about Bush’s inaction during his first few month of office. In another passage that critics will love, Rizzo recalls Bush’s public denials of any sort of rendition program: “It’s not that he deliberately lied---I am sure that he did not. Still, his answer wasn’t true.” Rizzo doesn’t even address the question of whether any of the intelligence revealed by the EITs was true or not. Also, some parts of the book seem to strain credulity. Rizzo writes that Porter Goss “never intended” to cover up the destruction of the CIA’s EIT tapes, for example. R. John does more justice to this book (is there a pun in there?) than I ever could, so just go and read his review. However, I just have to add..
Careerist? What an understatement! Rizzo believes that all the agents on the ground who were involved with the Enhanced Interrogation Techniques program were convinced it was necessary. How does he know this? Well, these were smart people-- so smart, that they'd know that participating in this program wasn't going to expressly help their career along - R. John does more justice to this book (is there a pun in there?) than I ever could, so just go and read his review. Careerist? What an understatement! Rizzo believes that all the agents on the ground who were involved with the Enhanced Interrogation Techniques program were convinced it was necessary. How does he know this? Well, these were smart people-- so smart, that they'd know that participating in this program wasn't going to expressly help their career along --and they participated anyway. Surely, nothing is more important than one's career? Rizzo seems to be unable to even conceive of a world where one would follow repellent job orders because they needed the money/health insurance. Likeable equals competent? Again, R. John understates this. Sure, it's one thing to stick up for your buddies who may have made bad choices but were really swell. It's another thing to defend the polices of individuals who were later revealed to be literally out of their minds (Reagan and Casey). Tone-deaf? Rizzo insists the EITs were not torture (just "hairy"). Torture terms are reseved for Rizzo's interludes with Congress, which he describes as "bloodbaths", and the Congressmen as "grilling" him. It's the story of a lawyer who rose to be the Acting General Counsel for the CIA. That explains why he's very careful with his words, why he uses lots and lots of abbreviations (at least he provides a list of acronyms at the beginning, and why there seems to be a lot of, I don't know, gaps, details, something missing from the story. In the epilogue, he explains that he had to submit the manuscript to the CIA for approval and they took stuff out. The introduction bored me to sleep, literally, but It's the story of a lawyer who rose to be the Acting General Counsel for the CIA. That explains why he's very careful with his words, why he uses lots and lots of abbreviations (at least he provides a list of acronyms at the beginning, and why there seems to be a lot of, I don't know, gaps, details, something missing from the story. In the epilogue, he explains that he had to submit the manuscript to the CIA for approval and they took stuff out. The introduction bored me to sleep, literally, but it picks up a little after that. So, don't quit after the intro. Give it a couple chapters. (Which is where my spouse gave up on it). All I can figure is it's Rizzo's chance to tell the parts of his story that his nomination interviews for General Counsel didn't let him tell. Not that he answers the questions any further, but he at least explains why he isn't answering. There's parts I can relate to - the bureaucracy, the aggravation of trying to deal with elected officials who seem to have no clue how career government people, who were hired and not elected, work. I'll give it to the guy that he really doesn't criticize these officials (with the exceptions of a few). I can't say it really made things clearer, but it reminded me that the media doesn't have the whole story, neither does the White House, Congress, the American people or the CIA itself. Made me want to hunt down Fox Mulder and ask questions. Really boring. I was interested to read this, but it reads more as an events and person list with very little dive into the details and 'secrets' of the inner workings. Also, if water boarding isn't torture, put yourself on the rack and take a dip. Report back. 1) It seems that the CIA, or at the least the CIA's upper management and OGC, was not only overwhelmingly white and male, but white men selected from a few elite east coast universities. (Has there ever been a CIA head or OGC head who was not a white male who went to east coast elite college? My research says no, but happy to be corrected.) Rizzo doesn't address how this homogeneity came to be, why it is and remains so exclusionary to non-white men, how it does or doesn't affect groupthink, and what that homogeneity means for national security. He married a woman who works for the CIA, so it would not be difficult for him to hear the opinion of a non-white guy in the service! I think most white men of his generation just didn't think about this stuff, it was just the way it was, and you pretended/believed you were all in a colorblind meritocracy - but I wish he would grapple with it in the book. You'd think a book written by a CIA lawyer would be like reading a text book, but this book was super engaging. It gives you an insiders look on how the CIA is run, and just how reliant the agency is on relationships with members of congress and administrations. The deep dive into the enhanced interrogation tesuniqes fiasco was also fascinating, and eye-opening. If you'd like to see how the sausage of intelligence policy is made, give it a try. Mr. Rizzo candidly weaved a four decade / 7 president / 11 director story about our premier intelligence apparatus's infrastructure. Though I feel different than Rizzo about torture (he'd call it EIT), I can understand his rationale for the label and practice. All in all, a good read by a good public servant. Very interesting and insightful read. John Rizzo did a great job telling his story. It was great to get his perspective of the EIT program as well as the Iran-Contra scandal. In addition, John Rizzo shows that partisan politics doesn't have to infect everyone in D.C. despite decades of being surrounded and exposed to nothing but partisanship. Told from the perspective of a CIA lawyer, this memoir was surprisingly entertaining, not dry and plodding, as some legal times are. The view of CIA activities from a legal viewpoint - not flashy counterintelligence operatives - makes you think differently about this agency and their mandate. I really enjoyed this memoir by John Rizzo, who was a lawyer for the CIA for three decades. He seems like a man of principle, with a great respect for his agency while at the same time not ignoring the faults and bad leadership he sometimes witnessed. Known news stories. Rizzo's disdain for anyone critical of the CIA (including and especially Clinton and Obama) is tempered by his loyal roots. Good read. Relatively balanced. Having read a number of accounts and perspectives of the CIA and national security from this time frame, Rizzo adds something useful. This book is worthwhile for anyone who wants to understand the complexities of national security in the last 25 years. Malcolm Gladwell recommended this book because he said a career bureaucrat have more to tell than a star. He was right. A great look inside the working of the VIA from there top lawyer at the time. Very honest and believable. Poor John Rizzo. He missed his calling as an affable stand up comedian. It takes him to page 182 to mention Hannah Arendt's THE BANALITY OF EVIL. An appearance I found incredibly tone deaf considering how much of his book is a tepid reworking of the Eichmann "careerist" excuse. There is no reason to doubt Rizzo's sincerity, though, he really was trying to protect the agents and assets under him from criminal prosecution. He understood the odious nature of the "enhanced interrogation program" and Poor John Rizzo. He missed his calling as an affable stand up comedian. It takes him to page 182 to mention Hannah Arendt's THE BANALITY OF EVIL. An appearance I found incredibly tone deaf considering how much of his book is a tepid reworking of the Eichmann "careerist" excuse. There is no reason to doubt Rizzo's sincerity, though, he really was trying to protect the agents and assets under him from criminal prosecution. He understood the odious nature of the "enhanced interrogation program" and all the ways it compromised the CIA and the agents carrying it out. Rizzo was fully aware that the CIA was jumping into the deep end. For the first half of Rizzo's self-serving memoir, he paints himself as a competent policy wonk, though with a "hilarious" tendency to make awkward faux pas (like sitting in George Bush Sr's chair at one of his first CIA meetings)! His recounting of these situations are a wonderful defection technique. By painting himself as a self-deprecating workaday bureaucrat, by categorizing everyone's ability based on their likeability, and by continuing mentioning his cigar habit Rizzo grounds his scandal plagued tenure at the CIA in a sort of punched time card normality. But the insanity of the Iran/Contra affair (which he was charged to manage congress through) to the development of the "Torture Memos" is glossed over with an attitude of "Hey, at least, we could joke around in the halls!" The second half of the book is broken into to interrelated parts. How the "Enhanced Interrogation Program" came into being and making several reassurances that, while things were done (water boarding and some other technique too brutal to name), no one was tortured. Ever. And all those CIA "black sites" were actually really well run and not chambers of horrors. In order to do this, Rizzo compartmentalizes the Abu Ghraib atrocities, the WMD failure, and the creation of GitMo in order to dispel the climate of the times. While Rizzo takes some responsibility for the creation of the EITs, he does push the blame back to the Office of Legal Council at the Justice Department. He is quick to throw Yoo under the bus, after the fact. The last section of the book is an embittered tirade concerning the failure of his nomination to General Counsel. He rails against Congress members who snubbed him, refused to play nice, and who bought into the notion that the EITs were torture. A strange place to end the book, since I felt the tone utterly undermines his purposeful narrative voice up to that point. No longer just an affable guy at work, the reader hears Rizzo's real smug ego for the first time. John Rizzo spent over thirty years in various legal capacities with the CIA; that is, as a Company Man, serving several presidents, undergoing several near misses at the General Counsel post. He was acting general counsel on a number of occasions, but never achieved the top post. Politics, he says. Although, much of his career was exciting as you might expect a lawyer for spies to be, and even selfless in his opinion, to my mind, his shameful last few years at the agency negated the whatever good John Rizzo spent over thirty years in various legal capacities with the CIA; that is, as a Company Man, serving several presidents, undergoing several near misses at the General Counsel post. He was acting general counsel on a number of occasions, but never achieved the top post. Politics, he says. Although, much of his career was exciting as you might expect a lawyer for spies to be, and even selfless in his opinion, to my mind, his shameful last few years at the agency negated the whatever good he did during the previous twenty-five. Rizzo was the self-proclaimed crafter of the torture memos which gave legal cover to the horrendous EIT's (enhanced interrogation techniques) and black prisons which so shamed this country in the post-9/11 days. He claims that the techniques yielded valuable life-saving information that might have been gained in no other way. Whether that's true or not, I'm in no position to say. However, the fact that he asserts that the FBI distanced themselves from the program early on and that he fails to mention that the army field manual labeled waterboarding as torture cast doubts on his assertion. He also describes the scaling back of the EIT program to omit techniques such as water boarding and naked interrogation but makes no claim that this reduction in severity yielded less information or less credible information. If you knew nothing about John Rizzo, you'd see the title and think this was a juicy tell-all. But Rizzo plays the company man here as well, defending the CIA as a beleaguered organization of stand-up people working by the book, who took the fall for other people's mistakes. You're not going to get more than the official story here, but its mere existence is a telling glimpse into the unredeemable situation the CIA finds itself in. In short, the excesses of the early years caught up to them in th If you knew nothing about John Rizzo, you'd see the title and think this was a juicy tell-all. But Rizzo plays the company man here as well, defending the CIA as a beleaguered organization of stand-up people working by the book, who took the fall for other people's mistakes. You're not going to get more than the official story here, but its mere existence is a telling glimpse into the unredeemable situation the CIA finds itself in. In short, the excesses of the early years caught up to them in the 80's with the Iran Contra scandal. Clinton was stand-offish with the CIA and underutilized them through the 90's. They began to poke their heads back out during the Bush years, but not until they obtained plausible deniability from the White House. When the torture memos came out, along with Frank Weiner's scathing "Legacy of Ashes," a number of former CIA careerists came out of the woodwork to point fingers at others in disappointingly bland memoirs. There is so much that really gets on my nerves about this book. It would appear that if there is some organization claiming to have anything to do with intelligence, it would not have to use tools straight from the Inquisition times to collect information. It would use "brain power." Alas, the organization does not even recognize brain as an organ of human body. Hence they claim that waterboarding somebody 150 times a week does not harm any organs, and that's why it is not a torture. In light of There is so much that really gets on my nerves about this book. It would appear that if there is some organization claiming to have anything to do with intelligence, it would not have to use tools straight from the Inquisition times to collect information. It would use "brain power." Alas, the organization does not even recognize brain as an organ of human body. Hence they claim that waterboarding somebody 150 times a week does not harm any organs, and that's why it is not a torture. In light of this, it feels quite funny to deal with "intelligentsia." The Agency's failings are spectacular and, by nature, public, but I've always been a fan. Sure, it started as a love of James Bomd movies, but quickly matured into an understanding of what it means to devote so much to your job and country -- and never be able to acknowledge to anyone outside the office. That said, I found Rizzo credible, candid, and absolutely fascinating. and I'd recommend everyone at least read the epilogue re: drone strikes. They bother so much more than enhanced interrogatio The Agency's failings are spectacular and, by nature, public, but I've always been a fan. Sure, it started as a love of James Bomd movies, but quickly matured into an understanding of what it means to devote so much to your job and country -- and never be able to acknowledge to anyone outside the office. A career CIA lawyer writes about his 35 years at work. The book is well titled as apparently the CIA is run the way large corporations are run with emphasis on who knows whom, who likes whom and who has the bosses ear. Never mentioned is why the CIA missed the collapse of the USSR, or why the CIA missed Osama ben Laden or how the Soviet spy Ames worked for the CIA for years undetected even though his bizarre conduct was noticed. Rizzo is the lawyer who wrote the legal justification for 'water bo A career CIA lawyer writes about his 35 years at work. The book is well titled as apparently the CIA is run the way large corporations are run with emphasis on who knows whom, who likes whom and who has the bosses ear. Never mentioned is why the CIA missed the collapse of the USSR, or why the CIA missed Osama ben Laden or how the Soviet spy Ames worked for the CIA for years undetected even though his bizarre conduct was noticed. Rizzo is the lawyer who wrote the legal justification for 'water boarding'. A fascinating first-hand overview of the CIA from the perspective of the second in command of legal counsel , John Rizzo, covering among other things the Iran Contra affair and the aftermath of 911. Mr. Rizzo writes in an easy conversational style and, most interestingly to me, gives his take on the attitudes of the various presidents he has served under towards the CIA. His experiences culminate with the scandal involving the destruction of tapes which were taken during the water boarding of one A fascinating first-hand overview of the CIA from the perspective of the second in command of legal counsel , John Rizzo, covering among other things the Iran Contra affair and the aftermath of 911. Mr. Rizzo writes in an easy conversational style and, most interestingly to me, gives his take on the attitudes of the various presidents he has served under towards the CIA. His experiences culminate with the scandal involving the destruction of tapes which were taken during the water boarding of one of the architects of 911. The CIA's acting general counsel who helped develop the Enhanced Interrogation Techniques to wrest intelligence from Gitmo detainees. While I'm not a fan, his justification makes interesting reading, and the contrast he draws to this procedure and the US's use of drones to kill suspected terrorists -- and resulting "collateral damage" -- without gathering any intelligence from them will make you think. Really interesting memoir of a CIA attorney. I wondered whether something written by an attorney could be that exciting :-) but found this a fascinating read. I'm not sure I agree with the author on a few things like enhanced interrogation techniques, but he did seem to be a man of integrity and one dedicated to his fellow CIA employees. I enjoyed his physical descriptions of the characters ;as if it were fiction . The foreshadowing of his last hurrah was no surprise . A grateful and humble man who aided our country much more than the knife throwers in congress . A man who realized that he would have had to dance with Presidents ,Congress and his peers to advance it would require a .... Contra dance !